Neil Lennon is stressing that his future at Celtic does not rely on victory over Rangers on Sunday. The interim manager, contracted until the summer, is taking charge of his first derby since returning to the club. Victory would cement Celtic's position at the top of the Premiership, increasing their lead to 13 points. "As far as I am aware my remit here does not revolve around one or two games," said Lennon. "My role here does not depend on Sunday's result. It will depend on whether we can deliver trophies and I assume, in particular, the league title. "Win, lose or draw it is not going to have an effect either way." Can you name Lennon's XI in his last derby? How does Lennon's Old Firm record compare? A 30th-minute goal from Ryan Jack at Ibrox in December earned Rangers a win over their nearest rivals for the first time in 13 meetings. A result, Lennon says, that will provide inspiration this weekend. "I am sure it will be lingering in the back of the players' minds as all defeats do, so it will be extra incentive and motivation," he said. 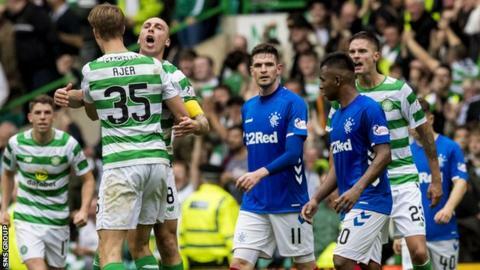 Defeat at Ibrox left Celtic level on points with Rangers, with a game in hand, but the champions have since extended their lead to 10 points. A home win on Sunday would be a "hammer blow" to their nearest challengers, said Lennon "but not insurmountable". "I want Rangers to feel the noise and the power that we can generate in the stadium, not just from the team, but the supporters as well. I think that is what being at home in a derby is all about. We generate that atmosphere and we feed off that." Brought back to the club following Brendan Rodgers' departure for Leicester City in February, Lennon will look to recreate the success of his last Old Firm derby in charge - a 3-0 home win in 2012. However, Lennon admits it is a fixture he has to "endure" not enjoy. "I think once the whistle goes you are fine, and you can take whatever comes with it, but the build-up can be tough at times," he said. "Again, this one has been a little bit different, a lot more calm, probably because we are in a decent position coming into it." Kieran Tierney is a fitness doubt, with Lennon saying the full-back "looked uncomfortable" with a calf problem, while Tom Rogic and Olivier Ntcham are back in training after knee injuries and defenders Dedryck Boyata and Mikael Lustig are fit again. "I am not a physio, so we will give it 24 hours and see how it goes," said Lennon of Tierney. "We have a fair idea what the starting 11 is going to be. We are just waiting for some players coming through. "We have had a lot of injuries, but it's good to see some quality players coming back. It gives everyone a boost, but the players who have played, particularly since I have come in, have done brilliantly. We will be prepared for any eventuality."